Here’s a list of the best seafood restaurants to try at Halfmoon Bay for a gastronomic adventure. This seafood shack specializes in Fish n Chips and Fried Calamari for a very reasonable price. Seafood lovers frequent the place because of their worth-every-penny meals. Their award-winning Clam Chowder is a must-try, because of its big servings, it can be shared by 3-4 people. Oysters are always fresh and juicy and are quite large, so it’s good for sharing. Their Fish n’ Chips is absolutely a must-try. However, lines can get long sometimes especially during lunch time, so it’s best if you arrive at the place early if you’re planning for a lunch out. award-winning Clam Chowder is a must-try, because of its big servings, it can be shared by 3-4 people. Oysters are always fresh and juicy and are quite large, so it’s good for sharing. Their Fish n’ Chips is absolutely a must-try. However, lines can get long sometimes especially during lunch time, so it’s best if you arrive at the place early if you’re planning for a lunch out. Are you ready for a one of a kind seafood experience? Visit Barbara’s Fishtrap at 281 Capistrano Rd, Half Moon Bay, CA. The restaurant is open from Monday to Thursday and Sunday, from 11am-8:30pm, and from 11:0am-9:00pm during Fridays and Saturdays. If you are looking for a nice place to dine around Half Moon Bay area, Flying Fish Bar and Grill should be on top of your list. This seafood restaurant specializes in cold seafood, appetizers, seafood tacos and salads. The best-tasting fish and chips is found in here. Customers keep coming back here to try their all-time favorite crab melt sandwich and Devil’s slide Mud Pie, a perfect way to end every customer’s hearty meal. Experience their excellent service from staff who are always accommodating and attentive. So the next time you visit the Half Moon Bay area, be sure to experience, first-hand, why people are raving about Flying Fish Bar and Grill. Visit Flying Fish Bar and Grill every Monday, Wednesday-Sunday from 11am-8:30pm at 211 San Mateo Rd, Half Moon Bay, CA. Or you can visit their website at www.flyingfishgrill.net for more info. This is the go-to choice for customers who are in for a delicious seafood treat. Located at 9 Johnson Pier, Halfmoon Bay, CA, this seafood restaurant prides its food choices like salmon fish, garlic prawns and their mouth watering crab sandwich. Clam chowder is also another favorite. What makes this restaurant a hit to the customers is because of its large food servings and simply delicious meals. This is a great place for small party gatherings especially because of its very casual ambiance. Come and discover why Princeton Seafood Company Market and Restaurant is becoming every seafood lover’s choice. Visit them from 11am-3pm , Monday to Thursday, and from 11am-6pm, Friday-Sunday. Go and check their website at http://www.princetonseafood.com. 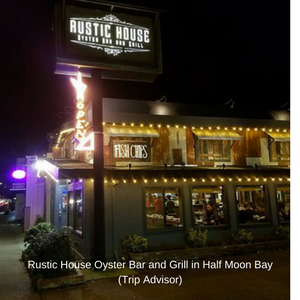 Rustic House Oyster Bar and Grill started it operation in 2016 and prides itself in being the only restaurant that specializes in fresh seafood. Their specialties like fresh oyster, fish and chips and lobster roll are definitely a must-try in this new addition of growing number of seafood restaurants in San Francisco area. Not only because of its fresh seafood offerings, Rustic House Oyster Bar and Grill is also a crowd favorite because of its friendly and accommodating staff. Rustic House Oyster Bar and Grill does not only offer a wide selection of seafood, it also has a great range of wines, beers and cocktails. Their deep fried green Beans with Wasabi ranch is a perfect appetizer for everyone to enjoy. Another best-seller is their Shrimp Tacos that will keep you craving for more. So why not invite your friends and family over for a delectable lunch treat or a weekend night out and enjoy everything Rustic House Oyster Bar and Grill has to offer. This must-try restaurant boasts its being an authentic east coast seafood experience in San Francisco area. Located at Cowan Rd. Burlingame, CA. New England Lobster Market and Eatery offers its guests a wide array of seafood choices – from lobsters to crabs and a whole lot more. Locals and even customers coming from far places visit the place because of their scrumptious seafood dishes. The restaurant’s Dressed Lobster roll with Coleslaw and House chips is a big hit to every diner. This dish includes a lobster dipped in butter, plus home-made chips and coleslaw on the side. You can pair it with lobster corn chowder for a complete dining experience. Customers keep coming back here because of their friendly staff and fast service, not to mention their delectable dishes at a very reasonable price. Restaurant usually gets crowded during lunch time up until late in the afternoon, so it’s best to visit the place early. Diners can also buy seafood at the market for home-cooking. Visit New England Lobster Market and Eatery at 824 Cowan Rd. Burlingame. CA 94101 from 11am to 9pm daily. Enjoy their Happy Hour specials during weekdays from 4-6pm and enjoy great deals and discounts. For more info, visit their website at www.newenglandlobster.net.